Writing your number on your arm and forehead seemed a little chaotic and unnecessary, but looking back it actually gave us a good laugh. I was so tempted to write something rude on Ian’s head… the trust you put in your friend/partner/teammate is an early sign of things to come! The event village was open with plenty of spots for support – we saw families cheering on loved ones, making for a great atmosphere. There was also plenty to keep spectators entertained. 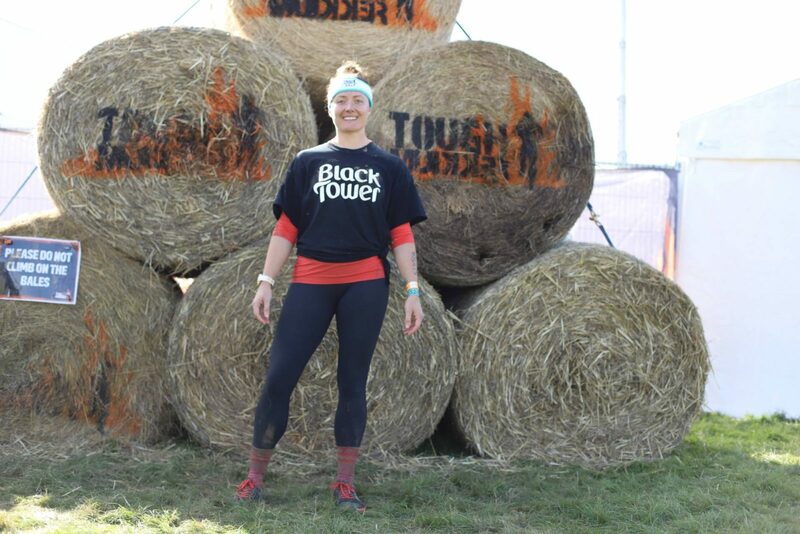 We both said it felt more like a festival than an Obstacle Course Race! Well done TM! The routes could easily have been confusing, with orange and blue dots marking the Half and Full, but signage around the course as it split into multiple laps and Marshalls at some intersections meant it was hard to get lost. Toilets en route were straight after muddiest section, and so were the aid stations… this didn’t seem like the most practical or hygienic way to do things, but sometimes you’ve got to embrace a slightly muddy TREK bar sample! The obstacles were fun and captured the team spirit, although Ian and I still tackled them mostly by ourselves except the log carry and the partner carry… obvs! Apart from one or two obstacles, there wasn’t too much of a bottleneck. 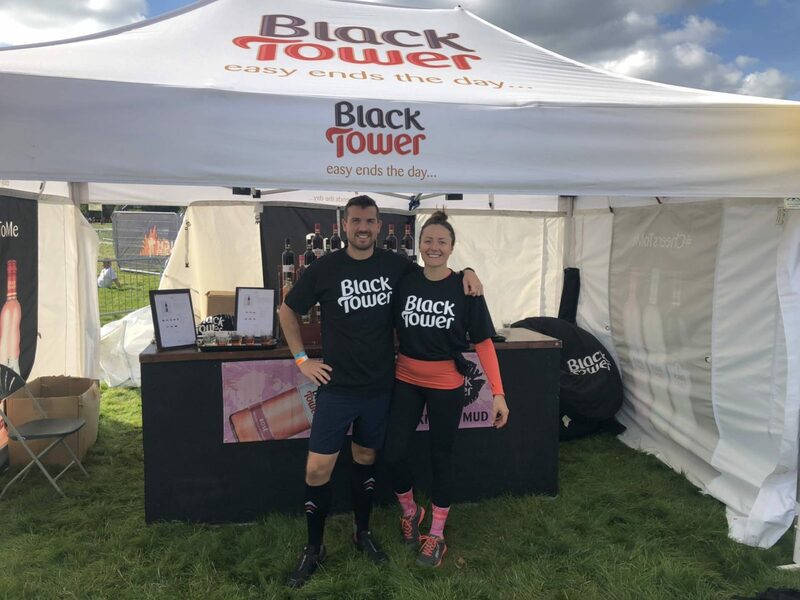 Actually, the Black Tower sponsored one seemed most congested because of the barbed wire – if only they handed out free samples of their limited edition Black Tower wine here! For me, some obstacles just weren’t worth the risk… e.g. dunking your head in skips of muddy water, plus the “walk the plank” and “electric shock therapy” obstacles from the Full (we did the Half). The final obstacle was impossible without help, but this forced you to get involved with your muddy comrades! Ian helped me, and in return someone else helped him. I can imagine some more shy people might have sat there for a while though! You don’t seem to get photos like you do with Spartan (despite having to write your number on your face…), or at least I couldn’t find them! I’ve seen some awesome promotional photos so it’s a shame not to have some to remember our own race by. I can see people picking up injuries here a bit more than at Spartan – for me it just seems a little more wreckless and less strength based. They do have a really good way of highlighting when there’s a “man down” though – everyone stays where they are and puts their arms above there head in a cross… think X Factor style! It’s really obvious and means aid is on its way sooner. 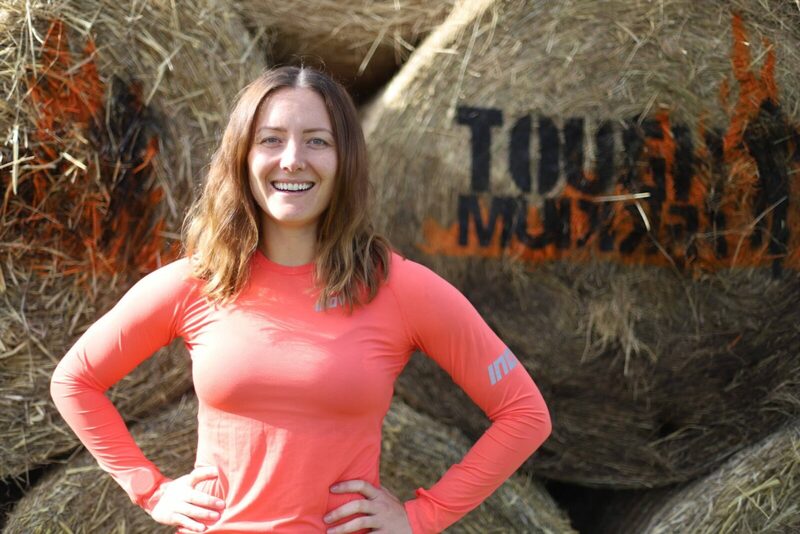 Overall, I enjoyed my Tough Mudder experience and can see how it would be great for team-building or a fun day out for a group of friends. 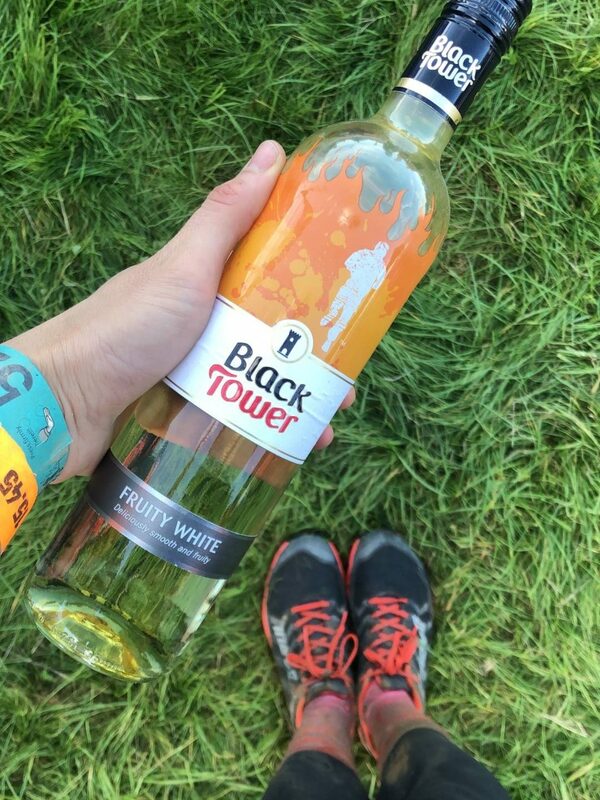 You can make the most of it with the bars (get your fill of wine at the Black Tower tent!) and the food stalls/DJ area. I also like the way they encourage repeat entrants by giving you different coloured headbands and other incentives. But for me, it would probably too risky to do again while I’m training for other goal races! 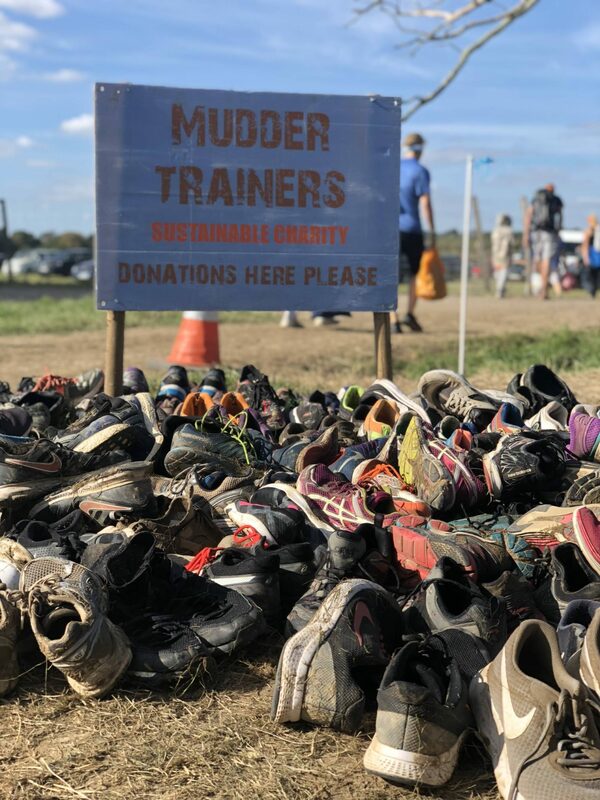 Have you ever taken on a Tough Mudder race? What did you think? Disclaimer: this post was sponsored by Black Tower Wine. 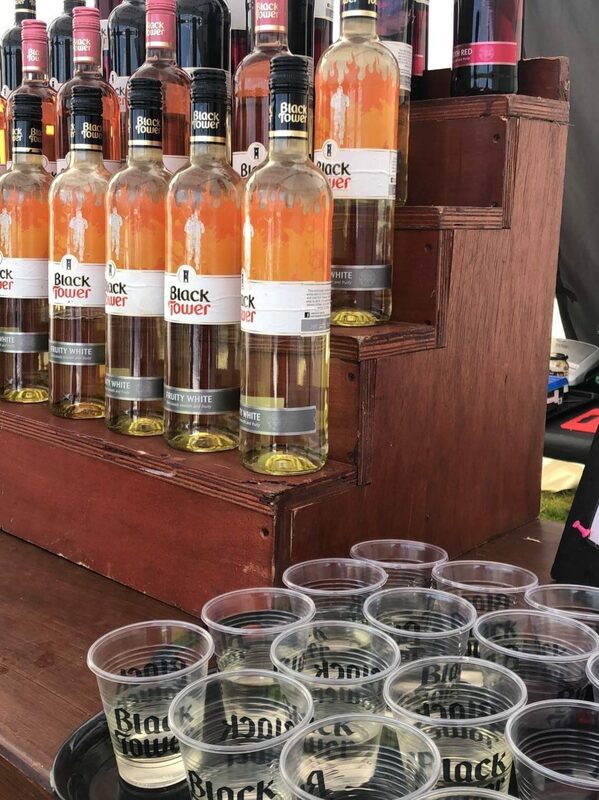 Ian and I received free entry to the Tough Mudder London South along with some wine to sample! All thoughts and opinions, as always, remain my own and unaffected by services and items gifted to me.